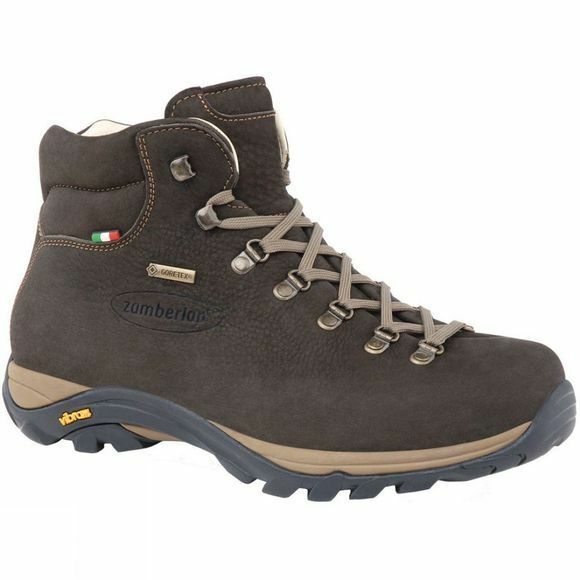 The Men's Trail Lite Evo GTX Boot from Zamberlan is a versatile boot for long hikes across mixed terrain. The single piece upper is made with tumbled nubuck for extra softness and this wraps around your foot, thanks to the foot wrapping lacing system and the Zamberlan Air System, to ensure comfort and support all through the day. The Gore-Tex membrane is waterproof and breathable to help maintain a healthy environment inside the boot, even on long days and the Vibram Pillow outsole features an EVA wedge for excellent shock absorption with every step along with well spaced triangular lugs for great grip on muddy terrain.